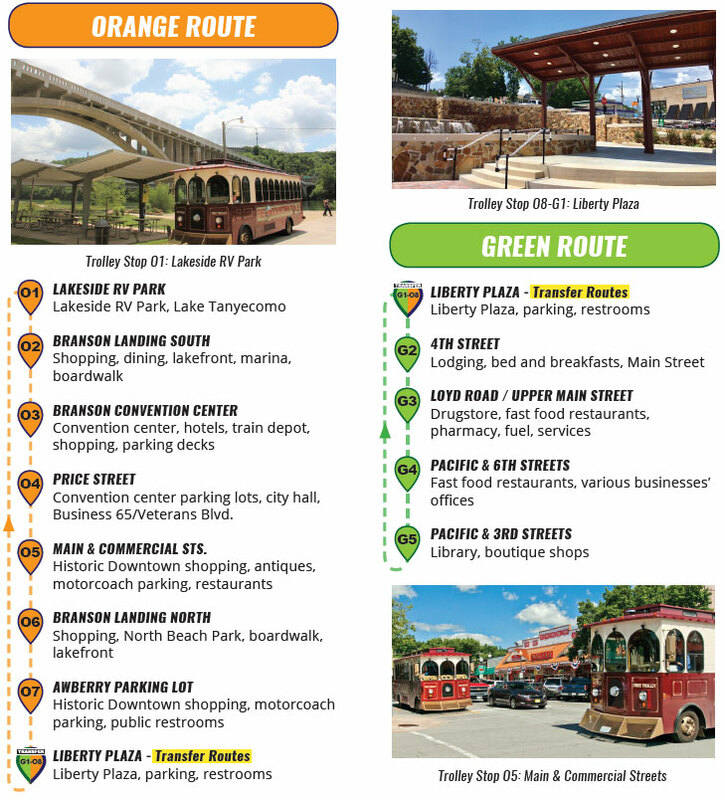 To better serve our riders, the free “Sparky” Downtown Branson trolley is dividing its previous single-loop route into two color-coded routes. The new covered trolley stop at Liberty Plaza will serve as a transfer point between the two routes. The new trolley routes are coded by color and are easier to follow. 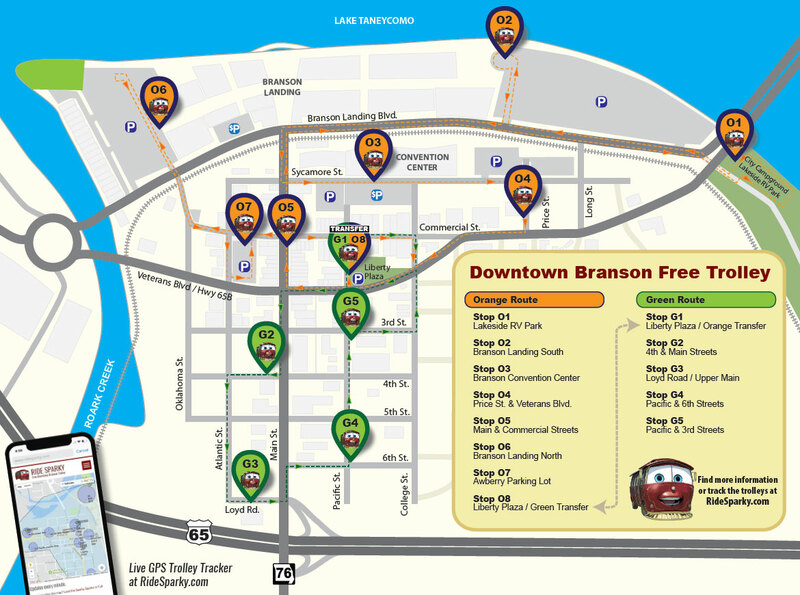 The eastern route, or “lower downtown,” includes the historic downtown, Branson Landing, convention center and Lakeside RV Park and is served by the 8-stop Orange Route. The western portion, or “upper downtown,” includes stops at hotels, stores, restaurants and the Taneyhills Library and is served by the 5-stop Green Route. Transferring between the two routes can be done at Liberty Plaza (Stop O8-G1), which has a covered trolley stop to shelter riders from the weather. The trolleys now have easy-to-see flags on their front bumpers to help riders identify which route a trolley is serving. With the exception of Stop G3 (previously Stop #9 between Chick-fil-A and McDonalds), all the trolley stops in the system have simply been renumbered. Stop G3, however, has been relocated to a new handicap-accessible stop that’s been built on Loyd Road next to CVS Pharmacy, directly across the street from Casey’s General Store. If you have questions about how to get from Point A to Point B in downtown, please check the new maps provided at each trolley stop. Or just ask a driver when you board a trolley. As before, the trolleys run from 9 a.m.-6 p.m., have wheelchair lifts and are free to anyone. Below is a list of the new routes and their stops.